7 Day Pill Holder Organizer is used to keep medications organized and safely dispensed. Each day of the week is clearly marked in large type on the compartment covers to make it easy to read and identify. Each compartment cover is also indicated with Braille additional identification ease. Each daily compartment for the 7 Day Pill Holder Organizer is easy to open and close. Manufactured by Mabis DMI, the Pill Holder Organizer is made of plastic and has a small profile so that it will not be in the way. 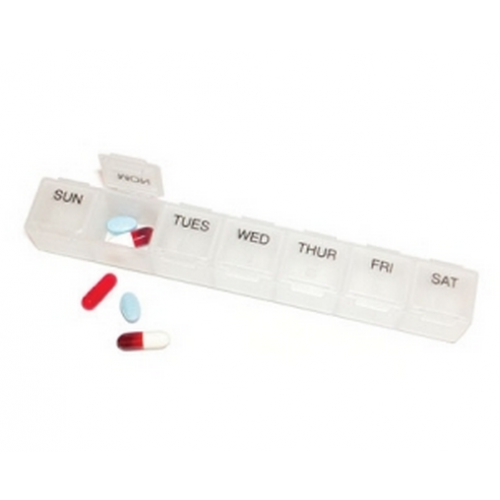 Economically priced, the 7 Day Pill Holder Organizer is ideal for multi pill daily needs. The Pill Holder Organizer is dishwasher safe. Each compartment also marked in Braille for easy identification. Easy to open daily compartments. 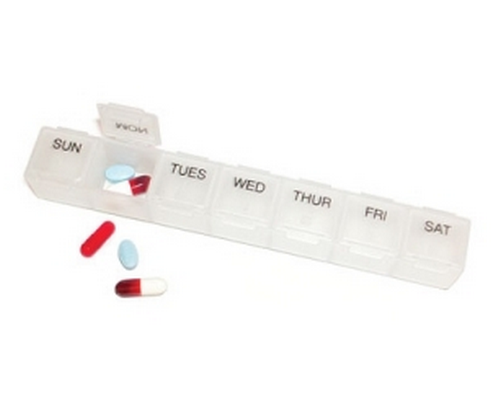 Mabis DMI 7 Day Pill Holder Organizer Product Number: 640-8218-9606. Size: Small, 7 day capacity. Legend: Sun, Mon, Tues, Wed, Thur, Fri, Sat. This pill organizer is handy and makes it easy to take my daily medications.